The Norway-Sweden border is regarded as constituting “the most advanced customs solutions in the world” utilising all the WTO’s international standards. Currently promoted as a possible post-Brexit customs solution on the island of Ireland, eolas examines its nuances. Following a 1994 referendum, Norway opted not join the EU (fearing a loss of control over valuable fishing waters), while the following year Sweden did. This meant that the EU’s external frontier shifted to the border between the two countries. While not an EU member state, Norway has access to the single market through its membership of the European Economic Area (EEA). Therefore, while most Norwegian standards for goods mirror those of the EU under the EEA Agreement, this excludes EU policies such as the Common Agricultural Policy and the Common Fisheries Policy. At the same time, the Nordic country is a signatory of the Schengen Agreement, but remains outside of the customs union. As such, while Norway fully complies with the EU’s acquis communautaire (incorporating the four freedoms: free movement of people, goods, capital and services), customs checks are still necessitated by rules of origin. The Nordic Passport Convention, 1957 guaranteed the right of travel between Nordic countries without a passport (similar to the CTA) and the Helsinki Treaty, 1962 established formal customs cooperation between Norway and Sweden. Later, upon Sweden’s accession to the EU, the Agreement on customs cooperation between the European Community and the Kingdom of Norway, 1997 was signed, which enabled Norway and Sweden to reach administrative arrangements on customs cooperation. Customs protocol is underpinned by regulations which are mirrored in both Norway (Regulations to the Act on Customs Duties and Movement of Goods) and Sweden (Customs regulations on cross-border cooperation with Norway). • the sharing of information between the two customs authorities. Across the 1,630km Norway-Sweden border there are 80 crossing points (14 incorporating manned customs posts), contrasting with some 280 crossings in Ireland. A total of 1,500 Norwegian Customs Service officers coordinate anti-smuggling operations (organised by a 250-strong Oslo central directorate) with the assistance of Nordent, an advanced communications network. Current rules on agri-food exports mean that divergent Norwegian product standards from those of the EU necessitates inspection on the border. 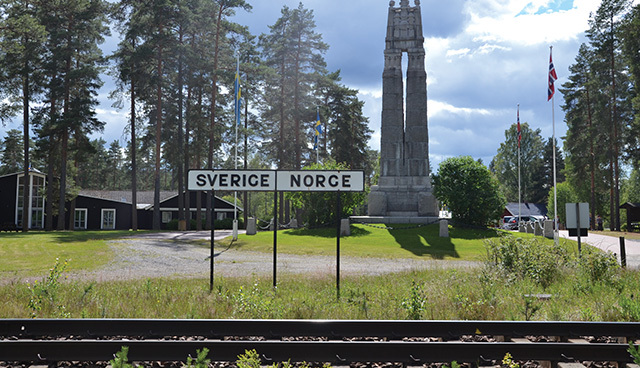 For goods traffic, Norway and Sweden require the submission of a pre-arrival information, through a summary declaration, at least one hour prior to arrival at the border. Upon arrival, most goods traffic is then processed within a period averaging three to nine minutes, though peak periods can have significantly longer waiting times. However, in compliance with certain conditions, including the submission of electric-only declarations, transport permits issued by each country can enable goods to be cross the border via unmanned routes. A percentage (4 per cent of import declarations into Norway and 13 per cent into Sweden in 2016) of goods traffic is selected for documentary or physical control. The rationale is risk-based and risk-management technology is utilised to select vehicles for such checks whereby large scanners are used to x-ray goods vehicles. A Norwegian ANPR system, linked to a national motor registry database, is used to identify suspicious vehicles. Since 2011, these cameras have been utilised along unmanned border crossings, and while they are not currently integrated into customs operations, this is set to change.